We invite you to explore India - the Land with infinite beauty ! Whether you soar high into Himalayas or peer under the ruins of the Ancient monuments dotting the landscape of India, you will cherish the experience long after your visit ! This India Travel Guide on Dholavira Kachchh is free from any commercial interest! This site is dedicated to promote India - the vast subcontinent, its glorious past, magnificent landscape and its infinite variety. Kotada timba or Dholavira is an archeological site located in Khadirbet of the Bhachau Taluk of Kachchh district in Gujarat. It stands surrounded by waters in the monsoon. 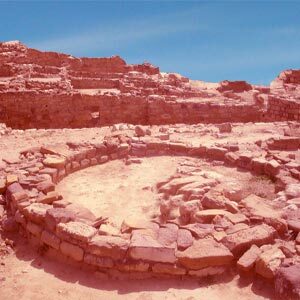 Known as an ancient Harappan city, Dholavira is the largest and probably the most prominent of the archeological sites in India that belong to the Indus Valley Civilization. The ruins found in Dholavira are believed to be more than 5000 years old. Historians date the site as early as 2650 BCE and it seems to have slowly declined after about 2100 BCE. Discovered in 1967-68, this is the fifth largest site in Harappa and in the Indian subcontinent. The site has been under excavations continuously since 1990 by the Archaeological Survey of India. The excavations under the supervision of Dr. R. S. Bisht at Dholavira brought some of the very significant Dholavira Ruins in Kutch. Excavations at this ancient site of Dholavira reveal two storm water channels - the Mansar in the north and the Manhar in the south. Excavations also brought to light the sophisticated urban planning and architecture that existed then. A large number of antiquities like seals, beads, bones, gold, silver, terracotta and vessels that were unearthed links this to Mesopotamia. All these also bear witness to the fact that Dholavira was a trading centre between settlements in South Gujarat and Punjab and Sindh and the Western Asia. Rectangular shaped Dholavira was spread over 100 hectares. Like Harappa and Mohenjo-Daro, this city followed a pre-existing geometrical plan which contained three distinct divisions namely - the Citadel, the Middle town and the Lower town. These divisions had their own defence systems and gateways, built up areas, wells and large open spaces. The carefully guarded citadel and the towering castles bear witness to the majestic and fairly insulated double ramparts. An amazing 48 hectares of fortification is found in Dholavira site. Perhaps the most striking feature of Dholavira is that all its buildings, built out of sheer stone stand well preserved, in contrast to the other sites in Harappa and Mohenjo-Daro excavations which were made of brick. An archeologist cannot miss the unique feature of Dholavira - excellent water conservation systems of channels and reservoirs. These were completely built of stone and were used for storing fresh water brought by rains. The desert climate of Kutch, with its meager rainfall may have contributed to building of these reservoirs. While these reservoirs skirted the city, citadel and bath lay centrally located. Bathing tanks have steps leading inwards. Large wells and stone cut troughs are connected the drains to a storage tank. A number of funerary structures are also found in these excavations throwing light on the socio religious beliefs of the ancient civilizations. Inscriptions reveal that the writing was from right to left, so far the signs that stood for words and syllables have not been deciphered. Most of the inscriptions are found on seals made of clay on which the seals were pressed as an impression. Copper tables, bronze implements, and other small terracotta and stone objects also bear inscriptions on them. Ten Indus glyphs were found in Dholavira. Ten big letters were found on a big wooden board, which seem to have fallen off, although the letters remained. These letters are comparable to large bricks that were used in nearby wall. Each of the letters is about 37 cm high and the board on which these letters were inscribed is about 3 m long - may be the oldest sign board in the world. The composed letters were of cut pieces of a milk white material. Historian and archeologist R S Bisht opines that the inscription must have been originally mounted on some kind of board above a gateway and 'could have been meant for the public to read'. Dholavira is ideal for those who are interested in primordial civilization and ancient history. Dholavira excavations reveal exquisite town planning, monumental structures, excellent architecture and remarkable water storage and management systems. The archeological excavations have revealed seven significant cultural stages. Stage 1 is when the settlers come into the virgin ground and advance ceramic techniques, copper and lithic industry, bead making and stone dressing. Formidable fortifications made of molded mud bricks of standard sizes were used to build houses. Increase in ceramic forms, decorations and antiques are marked in Stage II. The creative period of Dholavira can be found in Stage III. The division has now grown into a large town. The entire settlement had a natural catastrophe and these marks are clearly pronounced in the excavations. The principal divisions numbering three, a ceremonial ground, a series of water reservoirs are clearly evidenced by archeologists. The Stage IV of the excavations reveals the classical Harappan culture, with its many elements such as pottery, seals, lithic tools, beads, weights people used - all significantly devoid of any urban artifacts. Other items such as gold, copper, stone, shell and clay were also found in abundance. Functional pillars and columns made of locally available limestone stand out. Stage V describes the general decline in the maintenance of the city and this is reflected in its Citadel. This was followed by a stage of temporary desertion of the site. Stage VI reveals the Harappan culture found widely distributed in parts of Gujarat, a culture incorporating pottery traditions, albeit with remarkable change in styles. Stage VII has new comers closely related to their predecessors of Stage VI. As historian Allchins surmises, it is not clear as yet whether the earlier occupation should be classified as early Harappan or as a local culture. Urbanization that seems to have made its beginnings in Stage I went on to develop till it was totally deurbanized at the time of Stage VII. Exploring this ancient site is almost like reading a book on Indus. It has thrown open several answers to riddles on ancient civilizations. Dholavira, almost like a model trading centre, with its giant reservoirs, high rise citadels, reveals a stratified society that existed some 5000 odd years back. The strategic acumen and water management skills of the Dholavirians in collecting and preserving water to meet their water requirements is amazing, to say the least. The burials in Dholavira indicate that they believed in after-life. Presence of a number of ethnic groups and their distinctive customs, are ample evidence of a thriving community, trading and attracting people from all over. The village is approachable from Bhuj via Rappar where there is a good road with regular bus service plying to Dholavira. One can reach Dholavira from Ahmedabad via Radhanpur and Bhuj.